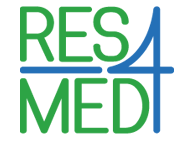 RES4Med&Africa will hold a B2G workshop in Cairo to accelerate the development of renewables in Egypt on 4 December 2018. Titled “Accelerating the development of renewables in Egypt”, the event gathers representatives from the private sector as well as government, international organizations, IFIs and press, to discuss the role of project finance and how it can secure and boost renewable energy investments to accelerate Egypt’s clean energy transition. During the workshop, the outcomes of a brand-new study “Project Finance Risk Mitigation on Renewable Energy Projects: The Egyptian Case” will be presented. 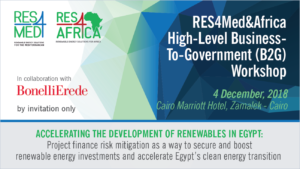 Carried out by RES4Med&Africa in collaboration with BonelliErede (in cooperation with Bahaa-Eldin Law Office), Pöyry Consulting, Enel Green Power, Italgen, RINA Consulting, PwC, Siemens Gamesa and Enerray, the publication aims at presenting an overview of project financing mechanisms and all financing schemes and frameworks that would allow a consistent and profitable investment in renewables, giving more confidence to international investors to develop renewable energy projects in Egypt.